Ramps and stations for bus guideways require extra space. 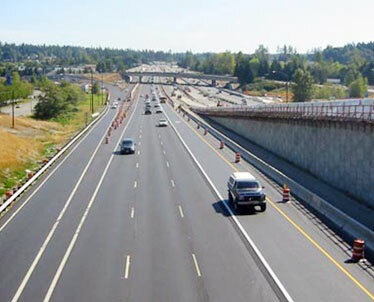 An express bus access ramp on I-405 near Seattle, Wash..
City Council members Donovan Dela Cruz and Ann Kobayashi incorrectly claim that there is a new bus fixed guideway system that could be completed sooner and at far less cost than a light-rail system. While no decision has been made on the technology for Honolulu's mass transit system, it is important to correct the misinformation in the Council members' column in last Sunday's Insight section. The transit technology they are proposing is not new. This alternative already has been evaluated and rejected because it costs too much, does too little and does not meet the criteria set by the City Council last year when members, Dela Cruz and Kobayashi among them, voted for a fixed guideway system. The bus fixed guideway system Dela Cruz and Kobayashi describe operating in France and the Netherlands is a bus rapid transit system, or BRT. Honolulu residents might remember the BRT proposed by the previous city administration and opposed by Councilwoman Kobayashi. This is the same system now being proposed by the two Council members. While the Council members have added some high-tech accessories, these additions do not transform the European BRT into a new alternative. It's still a BRT and would make sense for Honolulu only if we could build this system at grade and not construct an elevated guideway. Other cities are implementing BRT using existing roadways or abandoned railroads to save money, but that is not an option for Honolulu. Our geography dictates that we would have to build elevated busway structures and stations, which are much larger and more expensive than the rail-type fixed guideway structures, as you can see in the photos at right. The two photographs are of existing, very large busways. Dela Cruz and Kobayashi mistakenly claim it would be cheaper to construct a BRT system. But those claims are really just guesstimates and not based on any engineering design or real-world construction costs for Hawaii. Project engineers did perform a detailed analysis of an elevated bus guideway in preparing Honolulu's current Alternatives Analysis. Their conclusion? BRT construction, land acquisition, electrical work, engineering design and contingencies for a 16-mile, two-lane structure would cost $3.8 billion. Using that estimate, the cost of a 20-mile busway route going from Kapolei to Ala Moana Center would be a whopping $4.8 billion. Compare that to the $3.6 billion estimated price tag for the 20-mile, Kapolei to Ala Moana Center first project for fixed guideway, and it's obvious that the fixed guideway system is the best choice. Unlike the projections cited by Dela Cruz and Kobayashi, the cost estimates provided here were reviewed by several independent groups, licensed engineers and construction cost experts, including the City Council's own independent Transit Advisory Task Force. And, as it does with all New Starts Projects, the Federal Transit Administration commissioned a separate, independent engineering consultant to review the costs as well, and found these results to be reasonable. 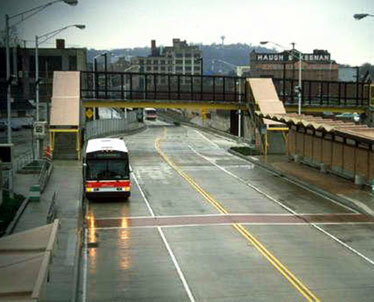 A four-lane busway station in Pittsburgh, Pa.. In terms of design requirements, BRT guideways are approximately 50 percent wider than fixed guideway systems, and for buses to access an elevated guideway would require the construction of ramps more than 1,000 feet long and about 20 feet wide. Construction of such large structures is extremely costly and has significantly more impact on the urban core than the fixed guideway system. With the busway's much larger guideways, stations and ramp structures, the Council members' claim that a bus fixed guideway system can be installed quickly and efficiently is incorrect. They also are mistaken in their claims that the elevated concrete busway, stations and ramps are flexible. They are more massive and obtrusive than typical rail-type structures. Not only are elevated BRT systems more expensive to build, they are less efficient than fixed guideway systems when it comes to moving people. Indeed, BRT capacity can never be as flexible as fixed guideway. Fixed guideway systems can have multiple cars running together. If one car is not enough during busy time periods you can couple it and run a two-car train. If two are not enough you can add another and run a three-car train. A single bus cannot carry as many passengers as a multiple-car train, and there are no options for expansion as future demand for ridership grows. The Council members mention many amenities that can be offered on BRT systems, but fail to say that these same amenities will be part of a fixed guideway system. These include wireless Internet access, audio and visual accents and vehicles that will be compliant with the Americans with Disabilities Act guidelines. Fixed guideway stations also will be ADA compliant and visually appealing. Individual communities will be included in our planning process and encouraged to express how they wish area stations to reflect and complement their respective neighborhoods. The process of designing stations will also include area revitalization possibilities. Mayor Mufi Hannemann and his administration are in complete agreement with Council members that Honolulu is in need of an efficient and affordable mass transit system, but an elevated BRT system is too expensive and inefficient to meet our needs. Melvin Kaku is the director of the city Department of Transportation Services.